Fenugreek leaves are very good for health and a great source of iron as well as having significant levels of potassium, fiber, and calcium. Few diet experts say that the leaves are nearly healthier than the spinach in providing an excellent dose of vitamin K.
You can either use it fresh if available or dried which is called kasturi methi. The recipe i share today is a chicken flavoured with this herb and coriander leaves. It has no spices except turmeric and so its a great recipe for those who cant tolerate spices. It also contains very little oil so i am going to categorised it under my health recipes section. I have served it with plain boiled basmati rice but it can be served with rotis also. wash the chicken and marinate it in 1 tablespoon of ginger garlic paste and salt and turmeric powder while you proceed with the recipe. Chop the onions fine and put them in a pan together with the oil to sautee. When the onions start turning brown add the remaining ginger garlic paste and cook for a few minutes taking care the onion does not burn. Add the chicken pieces and cover the pot. 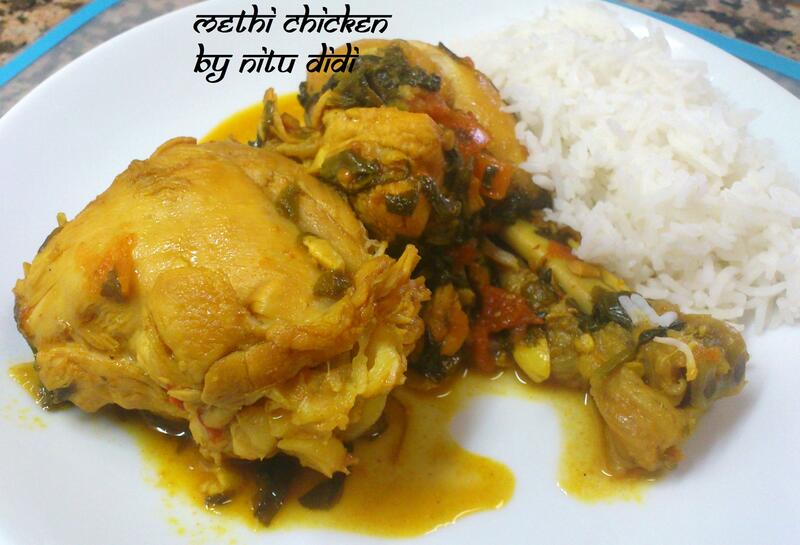 Let the chicken cook and when it starts browning add the fenugreek leaves and cook it for a while. Add the tomatoes and the coriander leaves and the green chillies. Cover the pan and let it cook. If the chicken is still uncooked (which might just happen, depending on what kind of chicken you buy) just add some water and let it all boil till the chicken is cooked. Check for seasoning and correct. Serve hot with basmati rice or rotis. This entry was posted in Chicken, Gluten Free, Healthy Options, Low Cost and tagged fenugreek leaves, healthy chicken, methi chicken. Bookmark the permalink. Oh wow, that looks so amazing, I feel like I have to make it right this second! Thanks for sharing! Thanks Nitu! Sounds Interesting, I don’t eat Chicken but can try Fish the same way:) Loves & Hugs!